Simvastatin is used to lower cholesterol and triglycerides (types of fat) in the blood. Simvastatin is in a group of drugs called HMG CoA reductase inhibitors, or "statins." All statins act by inhibiting 3-hydroxy-3-methylglutaryl coenzyme (HMG-CoA). 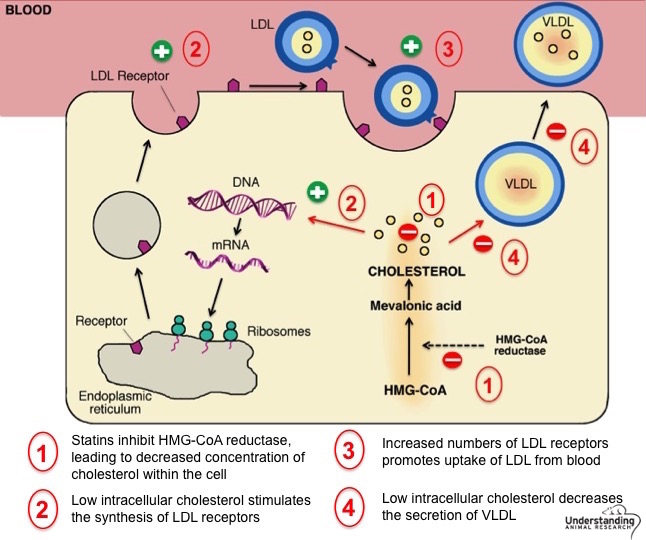 HMG-CoA reductase, the rate-limiting enzyme of the pathway, regulates the metabolic pathway responsible for the endogenous production of cholesterol. Simvastatin was discovered and developed at Merck. It is a derivative of a fermentation product of Aspergillus terreus. It was the first member of the statin class shown to reduce cardiovascular disease and mortality. Simvastatinis on the World Health Organization's List of Essential Medicines, the most important medications needed in a basic health system. It reduces levels of "bad" cholesterol (low-density lipoprotein, or LDL) and triglycerides in the blood, while increasing levels of "good" cholesterol (high-density lipoprotein, or HDL). By doing so Simvastatin lowers the risk of stroke, heart attack, and other heart complications in people with diabetes, coronary heart disease, or other risk factors related to cholesterol. Consequently it is used as a medication against these conditions. In the Scandinavian Simvastatin Survival Study (a placebo-controlled, randomized clinical trial of 5 years duration), simvastatin reduced overall mortality in people with existing cardiovascular disease and high LDL cholesterol by 30% and reduced cardiovascular mortality by 42%. The risks of heart attack, stroke, or needing a coronary revascularization procedure were reduced by 37%, 28%, and 37% respectively. The Heart Protection Study evaluated the effects of simvastatin in people with risk factors including existing cardiovascular disease, diabetes, or stroke but having relatively low LDL cholesterol. In this trial, which lasted 5.4 years, overall mortality was reduced by 13% and cardiovascular mortality was reduced by 18%. People receiving simvastatin experienced 38% fewer non-fatal heart attacks and 25% fewer strokes.